Tell the Senate: enough is enough. Home / Tell the Senate: enough is enough. 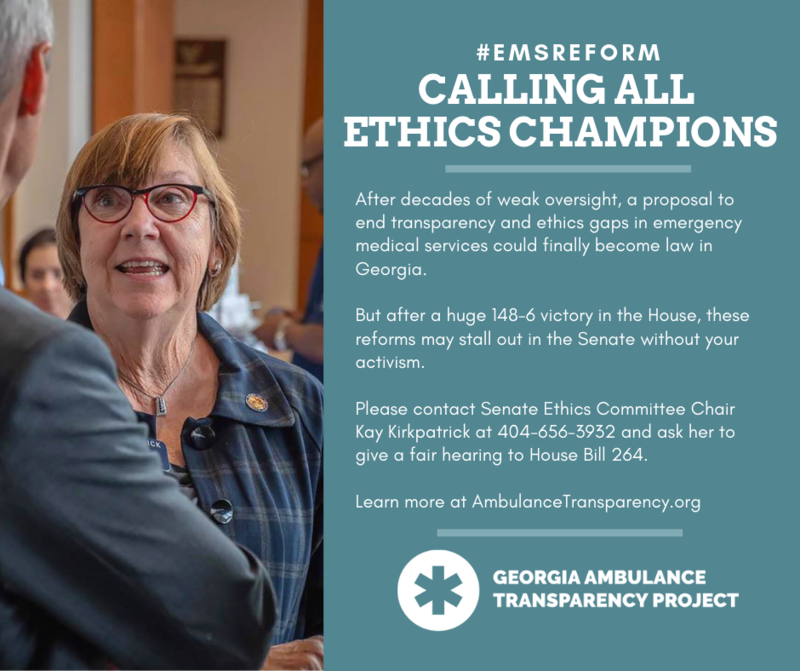 After passing the Georgia House on a huge 148-6 vote, common sense transparency and ethics reforms to the state’s EMS system might stall in the Senate. Please call Senate Ethics Committee Chair Kay Kirkpatrick at 404-656-3932 and ask her to give a fair hearing to House Bill 264. “Hello, my name is ________ and I’m calling in support of House Bill 264, which would restore common sense transparency and ethics controls to emergency medical services after decades of weak oversight. It’s important to me and my family that you please give HB 264 a fair hearing.